Chaparral Fifth Wheels have arrived here at Bob Scott RV and we’re thrilled to be carrying a new line! These sweet Fifth Wheels have lots of storage, roomy bedrooms and are spacious enough for long trips. Floorplans for these Chaparral Fifth Wheels include a 33′ rear kitchen design and a much larger 41′ model with a GVWR of 14,500lbs. 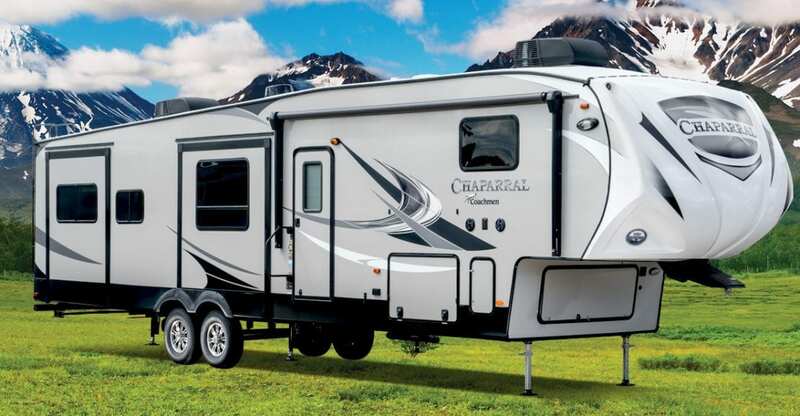 Chaparral offers three distinct series of 5th wheels catering to most all customer needs, providing a vast range of affordable price points, weights, and lengths. Whether the priority is towing with a 1/2 ton truck, or sleeping a family of ten, Chaparral has nearly every 5th wheel customer need covered. CHAPARRAL PRODUCT LINE UP All Chaparral product lines are constructed on the same production line with the same core construction methods and high quality materials. This clear advantage provides consistent reliability, greater R-ratings, and improved towing advantages throughout our entire product range. Take a virtual tour of the Chaparral 392MBL by clicking here. For a brochure explaining more about these great Fifth Wheels, click here.